This method involves organising your notes vertically down the page. It is probably the most common format, as it is simple to use and notes can be easily created with any program. An example of vertical notes. This method involves dividing the components of your notes across the top of the page, and filling each case in below. 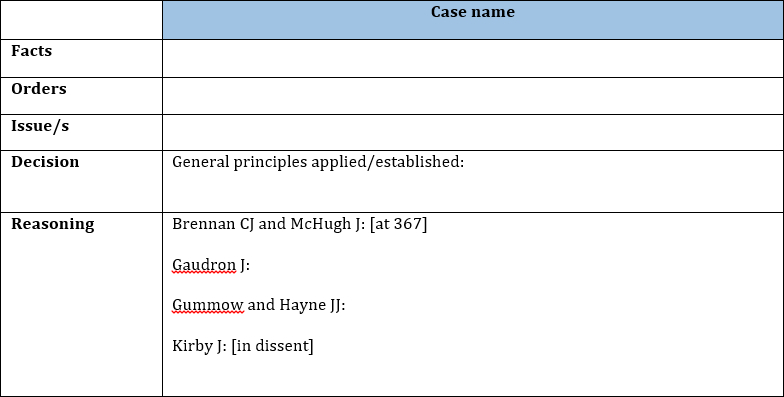 This method is a useful way of comparing different cases, however it may be difficult to manage unless you write your notes in landscape orientation or use spreadsheets. An example of horiztonal notes. Diagrammatic approaches to note-taking involve visually transforming the facts, reasoning and decisions of a case. While this method can aid in understanding and recalling cases, it can be difficult to capture the complexity and nuance of certain cases in satisfactory detail. A related approach which many find useful in aiding recall of cases is to draw the facts of the case. 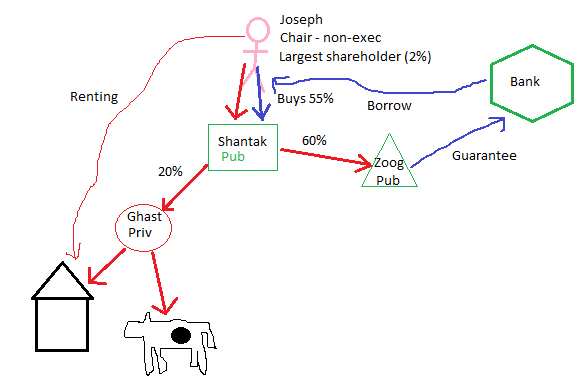 This can be a diagram representing relationships, or even just a cartoon of one of the parties or one of the key facts. There are specialist programs for doing this, such as Skitch or Freeplane, however Paint works just fine. One possible way of diagramming a fact pattern. The industry standard in note-taking apps. Simple to use, but very powerful, and integrated with a range of other apps. The layout of OneNote is particularly conducive to taking class notes and organising them effectively. This program comes packaged with Microsoft Office, so many will have it already installed on their computer. Requires a paid subscription otherwise. Both Docs and Sheets can be used to take notes. The advantage of this software is that it can easily be used on mobile devices and tablets, and every student has a Drive account linked to their student email. Xmind – Easy to use but very versatile, and produces some excellent looking mind-maps. The paid version allows you to create GANTT charts, which can be useful for time management. Freemind – Much uglier than Xmind, but has a lot more options. This can make it much more flexible than Xmind, but can also make it more difficult to use. Some tips on how to use mind maps to study law are available here.